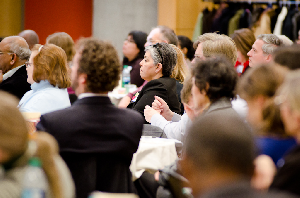 The Washington Research Library Consortium represents a community of nearly 600 library experts. The WRLC Sharing Expertise Committee develops strategies for sharing expertise and services within the consortium through a program of training and education, identifying expertise, and shared/sharing staff in order to build relationships across the WRLC. The WRLC Annual Meeting provides an opportunity for the 175 attendees to meet and discuss with their consortium partners the progress made and future plans for our work together. Using suggestions made by the attendees, a series of educational and professional development programs, the WRLC Forum, are regularly scheduled throughout the year. Presenters are primarily from among the WRLC library staff, but may also include outside experts. Topics have included description, access and preservation for digital repositories; RDA and linked data; and creating and editing audio-visual content. In addition, invitations to programs sponsored by the individual libraries are shared within the consortium. “Sharing Communities” allow colleagues from across the consortium to get together to discuss topics of common interest.